The European Commission and the European telecommunications industry are about to spend €3.5 billion (US$4.8 billion) to develop the fifth generation of mobile telecommunications. Neelie Kroes, vice president of the European Commission, sees 5G as a potential cure for youth unemployment, which has reached 70 percent in some areas of the European Union. It's also going to be key for e-health services and the automotive industry, she said at a news conference in Barcelona Monday. One challenge: just what is it that the industry is planning to develop? "I have no idea what 5G is," began Hossein Moiin, CTO of Nokia Solutions and Networks, one of the five founding companies behind the 5G Infrastructure Public-Private Partnership. But that's not a concern, as the massive investment will fund a project to define it, Moiin said at the event at Mobile World Congress. Marcus Weldon, president of Alcatel-Lucent's research arm Bell Labs, offered eight characteristics that 5G networks should have. They should be dynamically configured, dynamically scalable, and distributed not centralized, he said. And rather making a best effort at delivering all traffic, they should offer best efforts only for traffic that needs it. Where the first four generations of mobile networks were distinguished, at least when introduced, by the frequencies in which they operated, 5G networks should operate in any spectrum -- high frequencies or low, licensed or unlicensed, shared or dedicated, he said. The next characteristic -- that they should not be limited to just one type of waveform -- suggests he views the fifth generation as something of a mish-mash, rather than a pure standard. He concluded by saying that 5G networks should be people-centric and should harvest energy from their environment in order to operate. 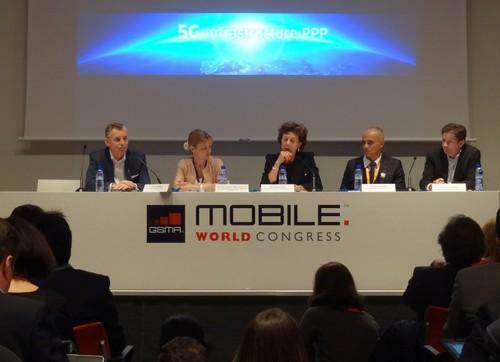 Kroes hailed the public-private partnership's event as the most important at Mobile World Congress. Her biggest worry, she said, is youth unemployment. European telecommunications businesses have great opportunities to create more jobs across the continent, but need "need to get back in the driver's seat," she said, referring to the way European companies were largely behind the development of standards for the second generation of mobile networks, GSM, and the third, UMTS. The Commission is investing €700 million to kick-start the 5G research project, part of a broader 10-year initiative to bolster competitiveness of European industry.